Who's ready for Valentine's Day? Your young Spanish learners are! Thanks to MommyMaestra sponsor Spanish for You! and their downloadable Valentine Card Game. Spanish for You! shares free monthly activities that help your child to learn Spanish in a fun way. 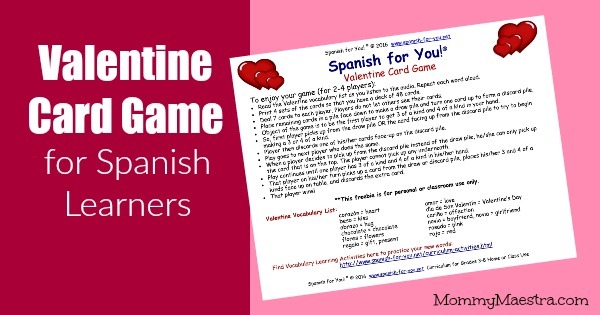 This month's download is super cute and introduces Valentine vocabulary such as corazón, beso, chocolate, flores, and many more. The rules are easy; just print the cards, deal, and play. The first player to get 3 and 4 of a kind wins! Parents, if you or your young students aren't sure about the pronunciations, you'll enjoy the accompanying audio to help you with the pronunciation of each word. This is great! I love using holidays as a fun motivator to introduce new Spanish words to my kiddos.